SIOUX CITY, Iowa – No. 7 seeded and #25 ranked Oregon Tech (24-9) met No. 2 seeded and #8 ranked Marian University (27-7) on the court in the Tyson Events Center on Wednesday afternoon for the second time in the team's history as part of the NAIA National Tournament, and – led by senior Mikaela Schumaker with a double-double – the Owls pulled off the upset with a final score of 63-50 over the Knights. The win sends OIT to the round of 16 at the tournament, where they will face Antelope Valley on Friday at 11:45 am (Pacific). 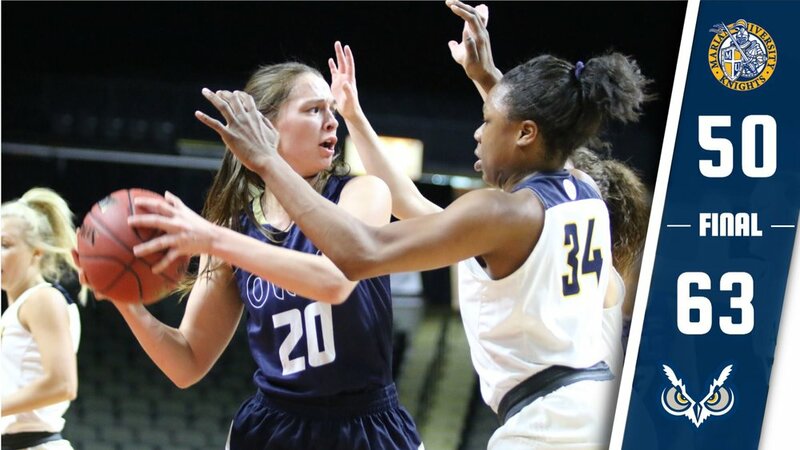 The last meeting between the two teams in 2016 resulted in a 72-66 loss for the Owls as Marian fought their way to the NAIA National Championship, beating Southern Oregon 59-48 to claim the title. However, things went differently this year as Tech gained an early advantage with a 13-4 run in the first stanza, with sophomore Abby Kreiser leading the charge. Kreiser led the Lady Owls in scoring with 16 points, with 12 of those points coming in the first quarter alone. The first period ended with a 24-15 lead for OIT, and a 12-2 run in the second pushed the Owls to their largest lead of 19 points. Though MU managed to outscore Tech in the final two stanzas, the early buffer allowed them to keep their lead to the end. A strong three-pointer effort from the Owls worked to their advantage, as they shot 47.1% on the night compared to a 13% average from Marian. Schumaker and Kreiser were responsible for most of the long-range shooting, with Kreiser shooting 3-for-6 and Schumaker shooting 2-for-2 on the night besides adding 10 points and 11 boards in the game. Senior Megan Morris followed with nine points and seven rebounds, and senior Nohea Waiwaiole led Oregon Tech to a 13-7 assisting advantage with adding five of her own, also grabbing eight points and six boards. Dejah Cyrus took game high honors with 17 points and nine rebounds and was one of three Knights to score in double digits, with Macy Willoughby tallying another 12 and Karne Jones notching 10. MU fought hard, forcing 19 turnovers and only committing nine of their own, but the Owls still managed to outscore them 12-9 in points off turnovers. Tech held a 47-34 rebounding advantage. The Lady Owls will continue to the next round of the tournament, playing on Friday at 11:45 AM with their opponent being decided later tonight as Antelope Valley and Morningside face off at 8:45pm.